Tom Petty has told us, through song, that he won't back down. Apparently he won't let up, either. 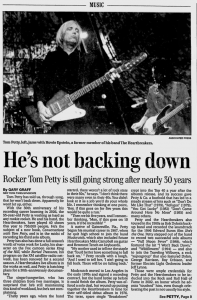 With the 30th anniversary of his recording career looming in 2006, the 55-year-old Petty is working as hard as any rookie rocker. He and his band, the Heartbreakers, have played 40 shows this year to 750,000 people. He's the subject of a new book, Conversations with Tom Petty, and is in the midst of recording his third solo album. Petty has also done a full season's worth of voice work for Lucky, his character on the Fox cartoon series King of the Hill, while Buried Treasures, his program on the XM satellite-radio network, has been renewed for a second season. A Heartbreakers live album is in the works as well, and Petty is hatching plans for a 30th-anniversary documentary. The singer/songwriter, who has three children from two marriages, is surprised that he's still maintaining this kind of workload, but he's not complaining. "Then we hit five years, and I remember thinking, 'Man, if this goes on 10 years, it'd be incredible.'" A native of Gainesville, Fla., Petty began his musical career in 1967, when he quit high school to join the band Mudcrutch, which also included future Heartbreakers Mike Campbell on guitar and Benmont Tench on keyboards. "My mother used to tell me the staple that 'You'd better have something to fall back on,'" Petty recalls with a laugh. "And I used to tell her, 'I ain't going to fall back. There will be no falling back.'" Mudcrutch moved to Los Angeles in the early 1970s and signed a recording contract, but the band broke up before it could finish the album. Petty was offered a solo deal, but wound up putting together the Heartbreakers in time for their self-titled debut album in 1976. The terse, sparse single "Breakdown" crept into the Top 40 a year after the album's release, and its success gave Petty & Co. a foothold that has led to a steady stream of hits such as "Don't Do Me Like That" (1979), "Refugee" (1979), "You Got Lucky" (1982), "Don't Come Around Here No More" (1985) and many others. Petty and the Heartbreakers also toured in the 1980s as Bob Dylan's backup band and recorded the soundtrack for the 1996 Edward Burns film She's The One. Petty stepped out of the band to record two successful solo albums -- "Full Moon Fever" (1989), which featured the hit "I Won't Back Down," and "Wildflowers" (1994) -- and also to join the Traveling Wilburys, a rock "supergroup" that also featured Dylan, George Harrison, Roy Orbison, and former Electric Light Orchestra leader Jeff Lynne. Those were ample credentials for Petty and the Heartbreakers to be inducted into the Rock and Roll Hall of Fame in 2002, an honor which he admits "touched" him, even though celebrating the past is not usually his style. "Well, it always means something when people give you a slap on the back," Petty says. "I feel that sometimes we're almost taken for granted. I think, if the group had broken up 10 years ago, 20 years ago, it might be different. But when you're there year after year and you stay consistent, sometimes you wonder if anybody notices. "I guess, when I was a kid, I might've been cynical about awards," he says. "But as I've grown older, I figure if they're giving it to me, I may as well enjoy it." 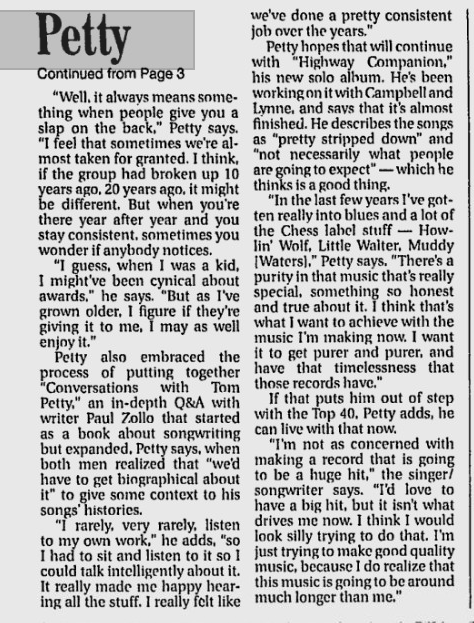 Petty also embraced the process of putting together "Conversations with Tom Petty," an in-depth Q&A with Paul Zollo that started as a book about songwriting but expanded, Petty says, when both men realized that "we'd have to get biographical about it" to give some context to his songs' histories. "I rarely, very rarely, listen to my own work," he adds, "so I had to sit and listen to it so I could talk intelligently about it. It really made me happy hearing all the stuff. I really felt like we've done a pretty consistent job over the years." Petty hops that will continue with "Highway Companion," his new solo album. He's been working on it with Campbell and Lynne, and says that it's almost finished. He describes the songs as "pretty stripped down" and "not necessarily what people are going to expect" -- which he thinks is a good thing. "In the last few years I've gotten really into blues and a lot of the Chess label stuff -- Howlin' Wolf, Little Walter, Muddy [Waters]," Petty says, "There's a purity in that music that's really special, something so honest and true about it. I think that's what I want to achieve with the music I'm making now. I want it to get purer and purer, and have that timelessness that those records have." 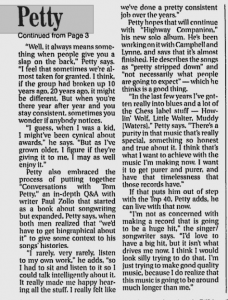 If that puts him out of step with the Top 40, Petty adds, he can live with that now. "I'm not as concerned with making a record that is going to be a huge hit," the singer/songwriter says. "I'd love to have a big but, but it isn't what drives me now. I think I would look silly trying to do that. I'm just trying to make good quality music, because I do realize that this music is going to be around much longer than me."